7,000 square foot retaining wall – completed in 2002. We were contracted to build a new, 300-foot retaining wall to maximize the parking area for the dealership. In 2008 we were asked to return to Shaw to complete a 5,200 square foot parts storage addition. One of our largest earthworks jobs, the 25’ high retaining wall built up the 32-acre property to provide significant development area for Dodge, Kia, Hyundai, and Concourse Auto Body (two additional lots are currently under development). Our team coordinated all deep services including roads, street lights, power and sewer. 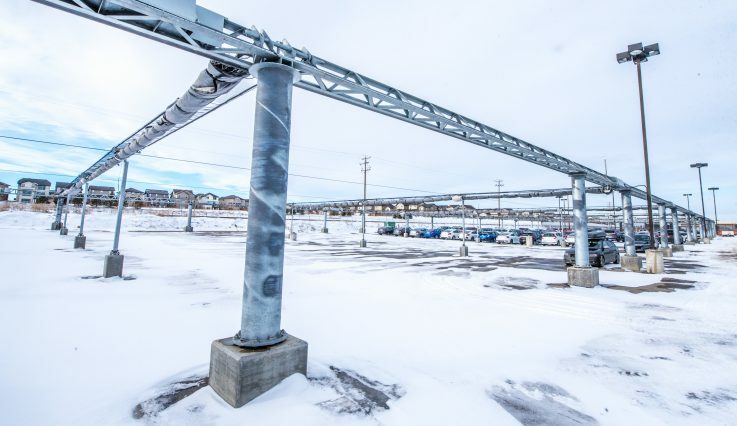 Adjacent to the Stoney Trail corridor, we developed this new vehicle storage facility, including street light installations, for the numerous automotive dealers in the Northwest Auto Mall.